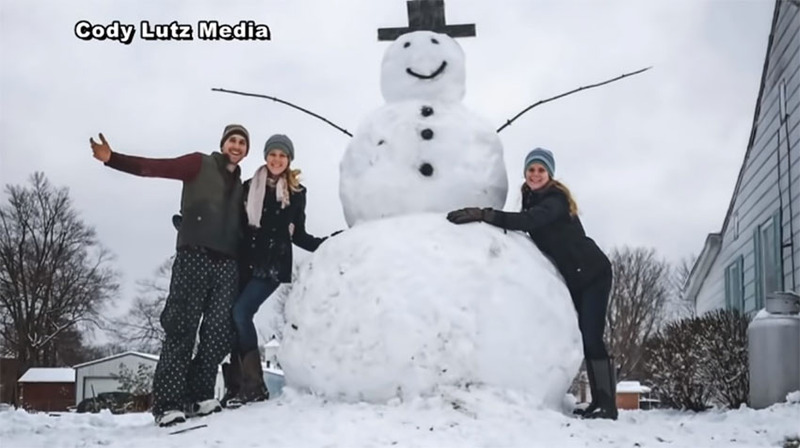 Cody Lutz of Kentucky built a big snowman in Petersburg last weekend together with his family, which they named "Frosty". But only a day later, they heard a loud sound of car's engine and a noisy hit early in the morning. One of the drivers wanted to destroy the snowman with his vehicle, but instead he got the best lesson! Cody, along with the family, placed the snowman Frosty on a big stork, then covered the rest of the stump with the snow. The unwise driver therefore thought that the snowman was standing on the ground. He drove with his vehicle straight towards the snowman when a collision occurred. With the front of the vehicle he hit the stump while the snowman Frosty remained almost untouched. The unwise act of the driver quickly circulated in the media, and Cody described the whole event as an instant karma for the driver.